There is a complex network of water pipes in most homes in the UK. As many of these pipes are located in the loft, they are more likely to freeze in the winter (if cold water pipes), but also they can lose heat (if hot water is sitting in them). To minimise the risk of both freezing and heat loss, these copper pipes can be insulated fairly cheaply with pipe insulation, often referred to as pipe lagging. Lagging is simply a tube of insulating material with a slit all the way down its length, which is fitted over the pipe and then held in place with electrical tape if necessary (it should be a snug fit, so this tape might not be needed). Fitting insulation to pipes is easy if the pipes are accessible and will cost from around £10. Professional help may be required to fit insulation to harder to reach pipework, which would naturally incur extra cost. Insulating your hot water cylinder is one of the simplest and easiest ways to save energy and money. Fitting a British Standard ’jacket’ around your cylinder will cut heat loss by over 75%. If you already have a jacket fitted, check that it’s at least 80mm thick. If not, it’s well worth treating your old cylinder to a new winter coat! When purchasing the tank insulation jacket, it is worth going to your DIY store knowing the height and girth of your water cylinder to ensure you buy one that fits snuggly, and it is important the jacket that you buy conforms to British Safety Standard BS 5615 (1985). If everyone in the UK topped up their hot water tank insulation to the full recommended thickness of 80mm, there would be enough CO2 saved per year to fill 5.3 million double decker buses. 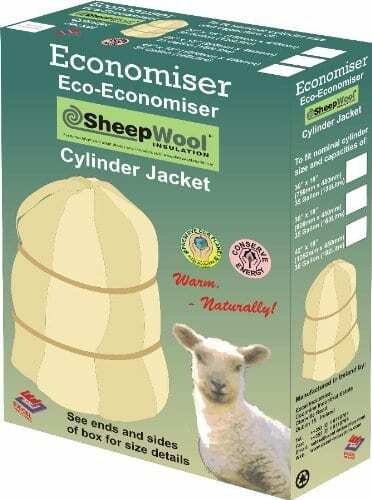 A hot water cylinder jacket costs around £15 and is a simple DIY job. Fitting a British Standard ’jacket’ around your cylinder will cut heat loss by over 75%. A new, 75mm thick hot water cylinder jacket will save you around £35 per year. Insulation for hot water pipes will save you around £10 a year. You will save about 170kg of carbon dioxide (CO2) when you fit a British standard hot water cylinder jacket and around 60kg of CO2 with pipe insulation. A new hot water tank jacket will save you about £35 per year, and cost you about £15 to install as a DIY job. This means it will payback in under 6 months and will also reduce your carbon footprint by 170kg per year. Primary pipe insulation will save you about £10 per year, and cost you the same to install as a DIY job. This means it will payback in about a year and will also reduce your carbon footprint by 50kg per year. What is lagging and is it worth doing?